My book has arrived! 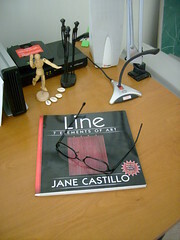 This is part one of seven books from Jane Castillo’s ongoing “Seven Elements of Art” series. “Castillo’s series on understanding the essentials of art is an indispensable kit of knowledge for everyone involved with the arts, from the art maker, to the museum goer, to the classroom teacher, to the home-schooler. Castillo fills an educational gap in a beautifully useful and inspiring way. Become visually literate in a flash! 7 Elements of Art is a dynamic new series of art books for young people featuring a blend of today’s hot artists and photographers. Each title focuses on a single element of art, Line, Shape, Color, Space, Texture, Value, and Form. Line, the first of the series, presents bold, colorful photos of lines in both our world and in contemporary art. An insightful connection between our everyday, global visual culture and contemporary artwork is elegantly achieved. Can you find the lines that are all around you? This innovative presentation is a sure hit for children and educators alike. From looking at ancient Greek columns to today’s hot artists, makes for learning about the visual element of Line fun.